Samsung Galaxy A50 (SM-A505GN) with 6 GB RAM has appeared on Geekbench today. In December, its 4 GB RAM variant had surfaced on the same benchmarking platform. The new listing confirms that the smartphone will be available in 4 GB and 6 GB RAM variants. Multiple reports have revealed that the SM-A505F is the model number of the forthcoming Samsung Galaxy A50 smartphone. 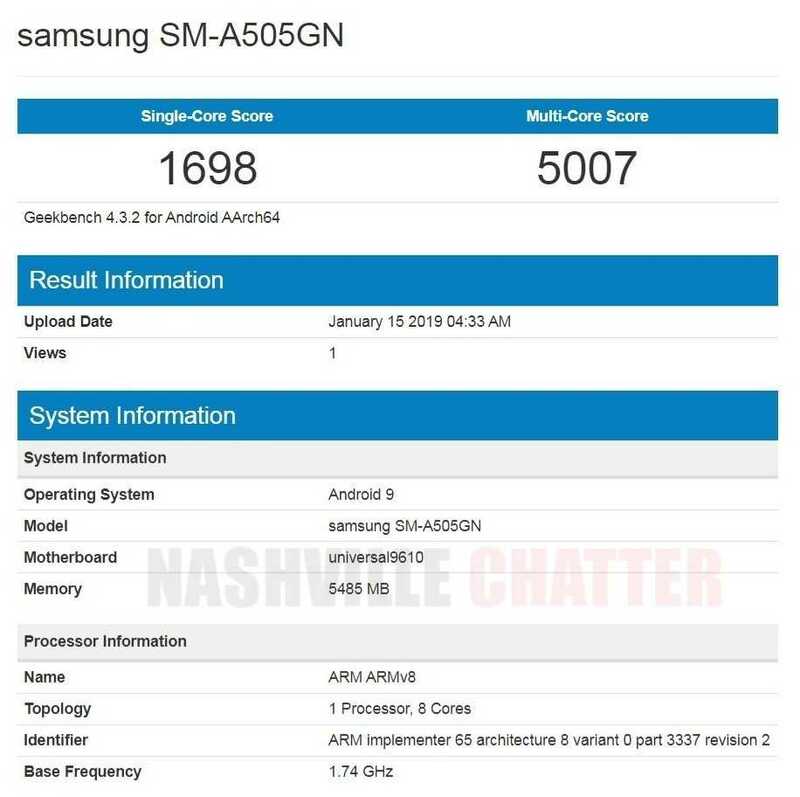 The new Geekbench listing for Samsung SM-A505GN also corroborates on the fact that it will be the first Samsung phone to be fueled by the Exynos 9610 chipset which was announced in March last year. The SM-A505GN Galaxy A50 phone is loaded with Android 9 Pie OS. In single-core and multi-core tests of the benchmarking platform, the Galaxy A50 has respectively scored 1698 and 5007 points. Yesterday, the Galaxy A50 was spotted on the website of WFA Alliance. The 4 GB RAM edition of the smartphone may come equipped with 64 GB of internal storage. Probably, the newly spotted 6 GB RAM edition of the Galaxy A50 will feature 128 GB of native storage. The Galaxy A50 will be carrying support for full HD+ resolution on its 6-inch display. It remains to be seen whether the handset will feature Infinity-O display like the Galaxy A8s smartphone. The upcoming phone is also expected to feature an optical in-screen fingerprint reader. For capturing marvelous selfies, the phone is expected to feature a 24-megapixel selfie shooter. It is also rumored to be packed with a 4,000 mAh battery. The Galaxy A50 is expected to release in multiple colors such as black, white, silver, blue and pink. Samsung is yet to confirm on the existence of the Galaxy A50. Rumors have it that the A50 could be unveiled after the Galaxy S10 series which is scheduled to go official on February 20.